When 19-year-old Marco created a comic book, community leaders in Tallahassee took him to court for obscenity. Now Marco is a convicted felon, banned by law from drawing. Loosely based on a shocking Florida court case, BUSTED JESUS COMIX is a cautionary tale from today’s culture wars. “Busted Jesus Comix”. . . belongs to a rich dramatic tradition of turning dirty-minded artists into First Amendment heroes. Playwright David Johnston and his collaborators are courageously defending rights that we should not simply take for granted these days, in this scary, funny, subversive, and ultimately uplifting cautionary comedy about abuse of all kinds against our citizenry. Read the nytheatre.com review here. 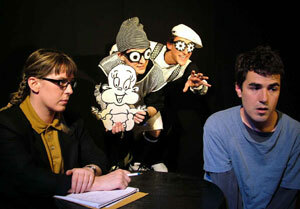 The play originally premiered as part of escape / artists: Moving Arts 2002 Premiere One-Act Festival. But we loved it so much, we just had to do it one more time! * Suggested Doubling: The Teenagers can (and should) be doubled with the Community Council ladies. One of the Up From the Closet men can be doubled with the Prosecuting Attorney. The Teens/Community Council ladies can also be doubled as the Up From the Closet men, as well as one taking the role of Jeffrey. The Prosecuting Attorney and Defense Attorney can be male or female. Actors playing Marco, the Manager or Jeffrey should not be gender-switched – there’s a little more play with the other roles, if that’s the way you want to go.